A futures contract is an agreement between two trade entities to make an obligatory purchase or sale of an asset such as a currency or a commodity, and for contractual financial settlement of that transaction as well as delivery of that asset to be made on a predetermined future date and at a predetermined price. In the online futures trading exchanges, these financial assets are traded without an actual exchange of the assets, and what is traded is the change in value of the contracts themselves. Futures contracts are different from spot trade contracts where settlement of obligations and delivery of the asset is performed immediately. The main essence of having futures contracts can be traced to its origins in the commodity markets of Japan (Dojima) and Chicago. Here, farmers needed to have a way of guarding against untoward events such as crop failure, drought or commodity gluts leading to price drops, so as to preserve the value of their commodities and get a fair value for them. On the other side, the dealers who bought these commodities from the farmers needed a way of protecting themselves against possible steep price increases that could result from droughts. The futures contract thus provided a way out for both parties in the trade. By stipulating a fixed price and delivery contract which would be settled when the commodity crops were harvested, both the farmers and dealers were assured of a fair and balanced trade contract that provided guarantees on both sides. This was reinforced by the fact that these contracts were binding and both parties were bound by the terms of the contract to fulfil their obligations to each other. In addition, farmers could use the futures contract to hedge against affectation of other aspects of their business. For instance, a cattle farmer wishing to hedge against absence of corn-based feeds for his cattle (which would cause sharp rise in prices of corn) can use a corn futures contract as a hedge, thus guaranteeing that his cattle will not starve and die off, rendering him bankrupt. In today’s online futures trading contracts, the parties to the trades are traders and dealers. The settlement is not provided in terms of physical commodities but in cash. So what traders are trading is the value of the futures contract. 1) Futures can be used as a hedge against undue fluctuations in the price of an asset. It can also be used as a speculate tool to trade price fluctuations of the asset. As an investment tool, it can be used as a two-pronged profit making tool by the trader. 2) Traders get to pay lower commissions on futures trading contracts when compared to other assets. 3) Futures contracts are highly leveraged, so traders can use small amounts of money to achieve greater gains. 4) Traders can make money from falling or rising prices, either by shorting the asset or by holding long positions. 5) Futures contracts are highly liquid instruments and there are always opportunities for traders to make money. 1) The same leverage that can help a trader use small amounts of money to make greater gains can also work against the trader to compound losses. 2) Lack of understanding of how to analyze the assets in a futures trade can lead to trading losses. 3) Trading futures is a lot more risky than spot trading as the contract sizes are much larger and can lead to devastating losses if not controlled. 4) The margin requirement for futures contracts are large and beyond the reach of most retail traders. Making Money From Online Futures Trading? As expected, the Euro falls on weak Eurozone data, prompting a drop from 1.2750 to 1.2400. – The current value of the contract = 125,000 x new price of Euro = 125,000 x 1.2400 = $155,000. – New value of Long John’s position = profit from trade + initial margin = ($156,250 – $155,000) + 8,000 = 1250 + 8000 = $9,250. 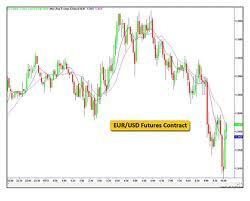 In this trade, 125,000 is the minimum contract size specification for the Euro futures contract.